The record is made up of 1 volume (5 folios). It was created in 26 Jan 1934-27 Feb 1934. It was written in English. The original is part of the British Library: India Office The department of the British Government to which the Government of India reported between 1858 and 1947. The successor to the Court of Directors. Records and Private Papers. The Anglo-Turkish Convention of July 1913.
text of the relevant article is given in section 11 of the Appendix attached to this Note. at any rate as regards the Barr-al-Qarah, by the line fixed by Sir Percy Cox in 1922.
entity on the mainland, and a reference to it for descriptive purposes was not unnatural. ownership between those boundaries and the blue line. Limit of any Oil Concession in respect of Hasa. printed as Appendix IV to this Memorandum. I) Extracts from Lorimer's Gazetteer. II) Anglo-Turkish Convention of 1913 (Unratified). III) Mr. Philby's Journey of 1932. 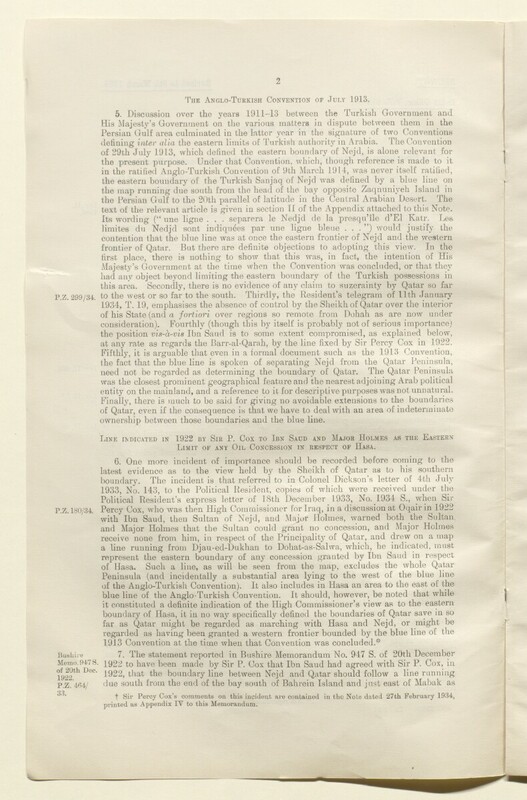 IV) Note of Discussion with Sir Percy Cox on 20th February 1934 on Question of Boundaries of Qatar. The main body of the report is followed by an appendix. Foliation: The file's foliation sequence commences at the first folio and terminates at the last folio; these numbers are written in pencil, are circled, and are located in the top right corner of the recto The front of a sheet of paper or leaf, often abbreviated to 'r'. side of each folio. This is the sequence which has been used by this catalogue to reference items within the volume. Pagination: An original typed pagination sequence is also present in the file.